Ryan said he could not stop smiling since recently securing his ideal job as an Apprenticeship Support Worker at Care Plus, Vulnerable Adult Day Services. Throughout his education, from leaving college and gaining his degree in Sport and Exercise Science at university, Ryan has had to overcome barriers and demonstrate his determination to succeed despite his condition – Asperger’s Syndrome. 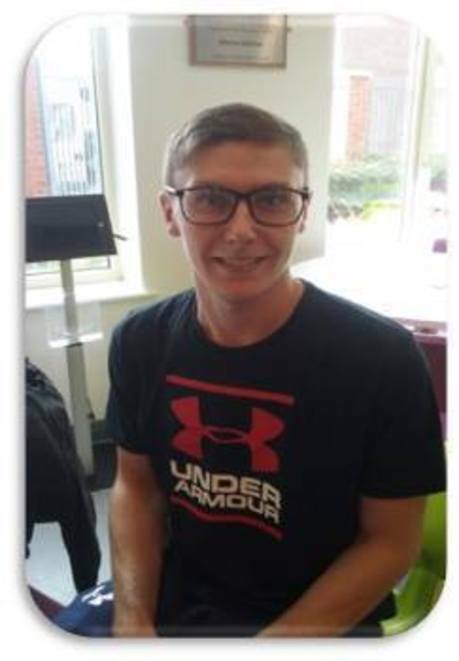 Ryan first started his journey with Employability Services – Supported Employment a few months ago after being referred from the Intensive Support Team, to aid him in his quest to find employment within the care sector. When the opportunity became available at Care Plus, Vulnerable Adult Day Services for an Apprentice Support Worker, Ryan was eager to apply. Norma Yarborough, Supported Employment Team Leader encouraged Ryan to apply for the vacancy, assisted him with the application process and provided interview techniques, in preparation for his interview. Norma said, “Ryan’s passion to help and support other people with disabilities and his caring and passionate nature will enable him to succeed within his new career pathway”. Ryan said ‘I am so happy I have got the job and without Norma I don’t think this would have been possible’.